Figuring out how much fertilizer to use for forage grasses can be challenging. Applying more fertilizer than what is needed wastes money and causes excess runoff. “Fertilizer costs in forage production are one of the most significant expenses facing dairy and beef producers, and keeping those costs down is extremely important,” said William F. Anderson, a plant geneticist for the Agricultural Research Service (ARS) in Tifton, Ga. 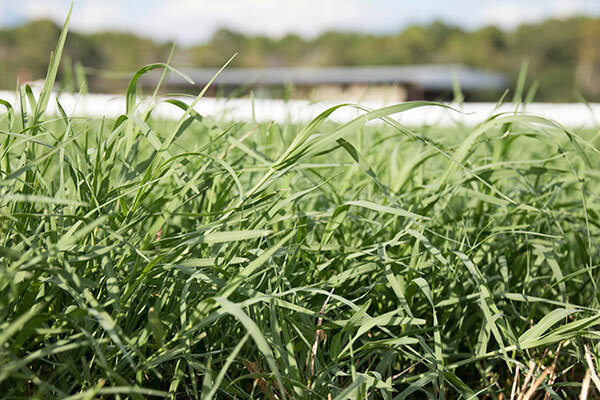 Many forage grasses prosper with help from nitrogen, phosphorus, and potassium fertilizers. However, adding more of one nutrient may reduce the impact of the others. Also, the same fertilizer can affect different forage grasses in varying ways, including the growth rate, yield, and nutritional quality. Anderson has developed recommendations for fertilizing forage grass in the Southeast, specifically Tifton 85 bermudagrass. He and his colleagues applied the three nutrients at different rates and studied the effects on Tifton 85, which is one of the most popular and productive hybrid bermudagrass cultivars grown in the South. Tifton 85 is widely used from Texas to the Carolinas to Florida. “Beef cattle gain healthy amounts of weight on it and dairy cattle produce more milk,” noted Anderson. Typically it is grazed, but can be cut four to five times during the summer to use or sell as hay. However, current fertilizer recommendations for Tifton 85 are from outdated studies focusing on other types of bermudagrass. In the study, Tifton 85 was fertilized using six nitrogen application rates and three rates for phosphorus and potassium. Fields with two common soil types in the Southeast were used. The researchers evaluated forage yields and nutritional value under each application rate. They tracked fuel and fertilizer costs and market prices for hay, and then they calculated the application rates most likely to return the highest profits. The study showed that a 4–1–5 ratio of nitrogen, phosphorus, and potassium, respectively, would maximize profits, assuming typical rainfall. The optimal rate for applying nitrogen fertilizer was found to be about 300 to 400 pounds per acre, which is the mid-to-low range of the application rates evaluated. A field will produce about 8 to 10 tons of hay per acre at this rate. Actual phosphorus and potassium fertilizer needs are based on soil test analysis, and nitrogen fertilizer applications should be made as two to three split applications over the course of the growing season. Sydney Sleep was the 2016 Hay & Forage Grower summer editorial intern and is a junior at South Dakota University.